The story of legendary martial arts master and Wing Chun practioner, Ip Man, more commonly known to Western audiences as the principle instructor to Bruce Lee, has been done to death at the cineplex to the point where Hong Kong action-star Donnie Yen (star of two films about the grandmaster simply titled Ip Man  and Ip Man 2 ) has publicly stated he will no longer reprise his role as the historical figure due to fear of cultural over-saturation of the material. I applaud Yen for his artistic and pop culture awareness (and also for portraying a more interesting, less hokey version of Man than was done here by War Kong-wai), but I’m afraid we’ve already gone way past the point of an acceptable level of cliched, pretentious, overly self-reflective East Asian films about famous martial artists. This stuff has gone on for so long and and at such high frequency since the Hong Kong kung fu glory days of the 1960’s that over-the-top, cartoonishly choreographed martial arts movies have reached such a stagnancy that even subtitle-fearing mainstream American film-goers have grown too familiar with them. Tony Leung looks as youthful and spry as ever at the ripe old age of 52 starring in his seventh collaboration with writer-director Wong Kar-wai. Here he faces off against a typical far less skilled opponent. Leung is rarely, if ever challenged in combat in The Grandmaster, and unfortunately that’s one of the film’s biggest weaknesses. Hong Kong critical darling and auteur Asian favorite, Wong Kar-wai, does his best to freshen up the increasingly stale subgenre by bringing his trademark colorful visual style to the forefront of The Grandmaster’s cinematographic charm. The aesthetic tone of the film looks a noticeable step above your average East Asian martial arts flick, looking more succulent and fluid than Yen’s Ip Man and built upon more expensive production values than the dirt cheap Ong Bak (2003). Wong spends plenty of time on close-ups and extreme close-ups on water, rain drops, whirling winds, falling leaves, waves of dust, and similar inanimate particles that highlight the environmental motion of the martial arts on display. For all it’s director’s visual charm and cinematic flavor, though, there’s not much to elevate The Grandmaster beyond your standard fair of preachy, overly dramatic, and way-too-philosophical-for-its-own-good Wushu movie. Most of the characters feel more symbolic than tangible, flesh-and-blood human beings, the dialogue is filled with generic one-liners and cheesy metaphors for wannabe martial arts masters to recycle to their gullible students at the local Tae Kwon Doe dojo, and the dance-like quality of the action scenes grows repetitive after the first forty-five minutes or so. Given how martial arts display is such a hyped part of a film like this, that last point is especially disappointing despite how predictable most fight scenes from kung fu movies have become over the past couple decades. What made Gareth Evans’ The Raid (2011) and its sequel (2014) so interesting was their change in flavor of close-quarters-combat (CQC) action scenes. The Raid films retained the focus on choreography of older martial arts movies, but modernized the concept by simplifying certain moves, toning down ridiculous acrobatics, and emphasizing handheld (not shaky-cam) camerawork. Evans’ films highlighted the physicality of martial arts through prevalent blood squibs, grimy set-locations, and bone-snapping sound FX. Another way of contrasting The Raid films with their East Asian action-movie ancestors, of which The Grandmaster is the epitome of the latter’s style, is that the former’s action scenes feel like fights, where as the latter feel like dance-scenes. Even if you ignore the questionable physics and lack of emotional investment in The Grandmaster’s fight sequences, the rest of the movie rarely excites due to the characters exchanging hokey lines through cliched metaphors about martial arts philosophy, family honor, and technical prowess. The characters feel dry due to the fact that most everybody seems to sport the same blank, zen-like expression on their face the entire movie. Do these guys feel emotion? Are they human beings? In terms of cinematic mood, lighting, and set-design, The Grandaster is impeccable. I just wish Wong had spent more time on crafting the physicality and flow of the actual human bodies on display. The impressive aesthetic appeal of the film (in terms of cinematographic flavor, color composition, lighting, and sound editing) is impressive enough that fans of Wong’s signature auteur style may gain enough satisfaction out of this cliched, painfully unoriginal kung fu dance-athon. I think Wong’s soft, sensual, almost seductive style works better with romantic dramas like In the Mood for Love (2000) or its sequel, 2046 (2004), than in martial arts films, even an “artsy,” metaphorical one like this. His confusing writing and inexperience with crafting effective fight sequences make this a passable film for me. It’s neither intelligent enough to please the arthouse crowd, nor gritty enough to please action die-hards like myself. If you should watch any film about the famed martial arts master, Ip Man, watch the eponymous one with Donnie Yen — or just watch the Raid films. Seriously. 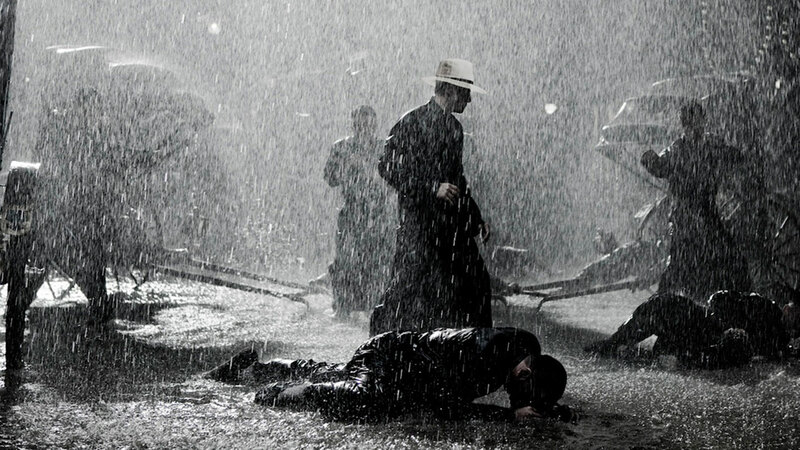 SUMMARY & RECOMMENDATION: The Grandmaster’s “fight” sequences, while filled with cool shots of things like wind, dust, and water droplets, are not filled with much cooler things like hard-hitting action and realistic choreography. There’s nothing in any of these fight (dance) scenes to make me care about the fates of those involved, no pacing or desperation in the players, no memorable audiovisual editing, nor climaxes in the action. 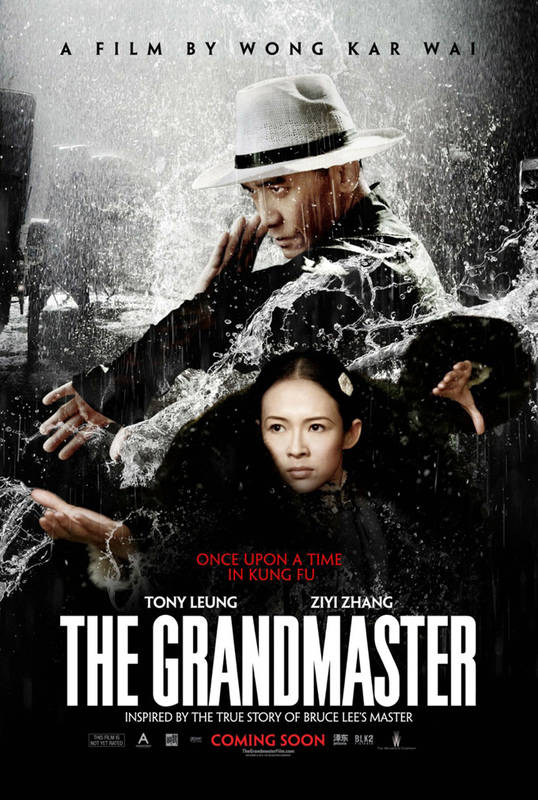 The Grandmaster has a talented cast composed of the likes of Tony Leung and Zhang Zhiyi, but wastes them on cliched dialogue filled with hokey spiritual metaphors and a confusing story. No one seems to be able to crack a smile, get angry, or otherwise confirm to me that any of the characters are humans possessing emotion or humanity. — However… Wong’s visual style with regard to atmosphere and tone is excellent. His attention to environmental details is commendable.
? A good action movie is not afraid of its audience. A good action movie strikes fear in its audience’s hearts. A good action movie punches through the winds of incoming genre limitations and cliches to become uh, ah… eh, I give up.